I've had a Facebook account since my freshman year of college. Back then it was only for college students (as a side note, I wish that it still was). In the past four years they've expanded to literally allow everyone and their mothers an account. Case in point, my cousin's mother has one. With each new addition, Facebook users of old, put up resistance to the MySpace like changes that seem to pop up left and right. The changes that have occurred, and Facebook's slow transformation into a more organized Myspace, is a topic all it's own. Having seen the outrage and controversy created upon adding mini-feeds, Facebook, has tried to redeem itself by adding more and more security features which seem to progressively get more complicated and specific. With more security features comes the opportunity for what I like to call, preferential friendship, or limited friendship. Let me explain. I've received quite a lot of application invites, and honestly I'll ignore 90-95% of them. Recently I noticed that not only can you block all invites for a specific applications, but you can now block invites for specific people. How specific must we make our security options? 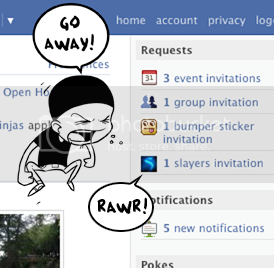 I think the next step would be to block all invites for a given application, by a specific person. Sorry Kenneth, but I will no longer allow you to ask me to use the potted plants gift application, however if someone else was to offer me a potted plant, I might just accept. Facebook recently upgraded their privacy settings to allow you to break down each section to allow or block others from viewing, think limited profile, but you have to specifically state who can view what. So if Jonathan wants to befriend you, you can show him only your general info and nothing else. But you could show John only your pictures and nothing else. Which makes me wonder. Is Facebook creating preferential friendship? Another point of interest is that random people tend to try and befriend others that they often don't know, or at least don't know well. This isn't that shocking as I'm guessing many of you have gotten that Friend Request notice and thought, "What? I don't even know this person." So the question is this; do you befriend them and place them on a specifically restricted profile view, which allows them to know what your name and birthday is, and that's the extent of your "friendship?" Or do you ignore the invite all together. I've chosen to do both. Firstly I've placed a handful of people on restricted profiles, each person who has that view, has these limitations placed on them due to different reasons, not really close to them, don't trust them any more than I can throw them, or the like. I also have a handful of Friend Request sitting in the inbox which, in all honesty, I probably won't touch for months on end. They too are sitting in limbo for different reasons, but mainly cause I don't consider them my friend or acquaintance. Some of them, I honestly have never said two words to them. In any case it seems that Facebook has transformed the word "friend" into something indistinguishable from "random guy that I know." It's created a class system for the 21st century, where the middle class is no longer, upper-middle class, middle-middle class, and lower-middle class, but "Friend. Friend who can't see my pictures and wall. And inbox dwellers. "But after all what really is a "friend?" Interesting thoughts I never really thought about it that way, and I totally agree with you on the application requests those things are annoying I reject them all no matter what.